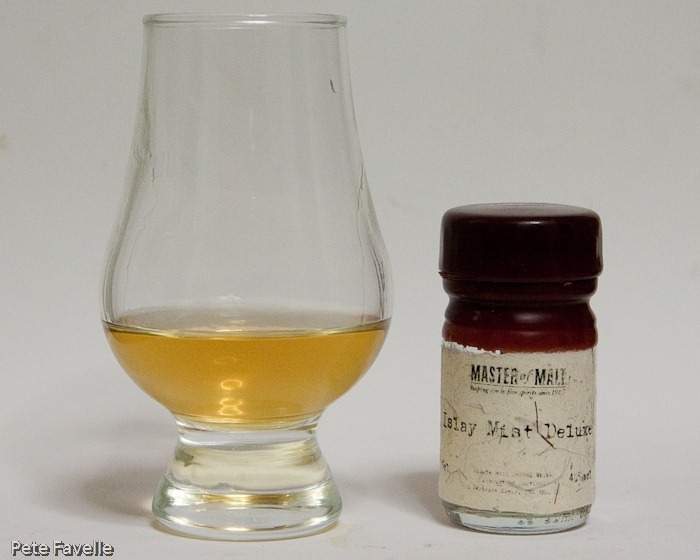 Continuing this mini series of anonymous Islay bottlings, this week we have Islay Mist Deluxe – which could either be a whisky, or a new paint colour. It’s a nice pale straw in the glass. The nose is light, almost floral with a grapefruit citrus feel to it – not entirely what Islay conjures up in my mind! There’s definitely some peat lurking underneath but it’s subtle, understated. A dash of water loses the sweetness a little, but reveals what I can only really describe as ‘beach-like’ notes; sea spray, salt, iodine. It starts sweet and honey like on the tongue, the alcohol gently washing that away before it gets too sticky and brings out just a hint of pepper. There’s a slightly raw feel to it, which makes me suspect there’s some quite young spirit in there but overall it’s a delicate, subtle dram – surprising for a whisky and doubly so from Islay. If anything, water enhances that honey flavour and with less of an alcohol bite, it lingers longer on your tongue. If the nose with water takes you to the beach, the taste takes you to the meadow – sweet, delicate, sundrenched. I’m in love with this one. It’s not a big, brash, complex dram for sure – it’s delicate, simple but finely balanced and very drinkable. I was going to say that I’d put it on my birthday list, but having discovered that it can be had for as little as £15 a bottle online, I’m just going to order a bottle now. Or maybe two.